Let’s face it, renovations and house constructions are expensive but what can you do if your kitchen has been deteriorating or your bathroom has broken tiles? Though you need to spend money on repairs and renovations, it doesn’t mean that you need to spend a lot on it. 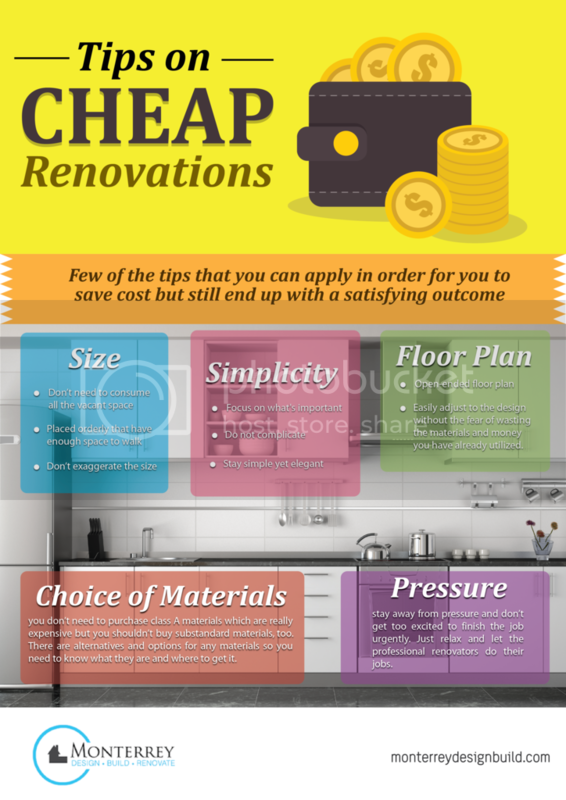 There are few and simple tips in order for you to turn a renovation into a cheap and yet a robust one. Size – you don’t need to consume all the vacant space of the kitchen. You just have to design it in a way that all you need are placed orderly and that you have enough space to walk. Don’t exaggerate the size especially if it doesn’t fit the overall design of the house. Simplicity – have the renovation designed in a way that only important things and parts are involved. Being complex and complicated don’t really add to the beauty of the renovation in fact it will just ruin the real beauty of simplifying the design and just use simple yet elegant looking furniture and wares. Floor Plan – make your floor plan an open-ended one, this way you can easily adjust to the design without the fear of wasting the materials and money you have already utilized. Choice of Materials – you don’t need to purchase class A materials which are really expensive but you shouldn’t buy substandard materials, too. There are alternatives and options for any materials so you need to know what they are and where to get it. Pressure – stay away from pressure and don’t get too excited to finish the job urgently. Just relax and let the professional renovators do their jobs.